Holiday Package Deals | Selangor: 3D2N stay at 5-Star Golden Palm Tree Resort Sepang (Travelers Palm Villa) with Daily Breakfast! 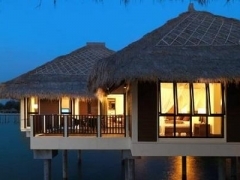 Selangor: 3D2N stay at 5-Star Golden Palm Tree Resort Sepang (Travelers Palm Villa) with Daily Breakfast! GOLDEN PALM TREE is a 5-STAR haven of peace, perfect for eco adventure, non-motorized water sports, family-friendly fun or to just relax and unwind! Golden Palm Tree Iconic Resort & Spa stretches out from the Sepang coastline, almost a kilometer into the sheltered waters of the Straits of Malacca with 392 luxuriously appointed sea villas that shape a palm tree. With minimum impact to the environment and touted to be the first eco-friendly sea-hotel in the world, Golden Palm Tree Iconic Resort & Spa is a 5 star haven of peace, perfect for eco adventure, non-motorized water sports, family-friendly fun or to just relax and unwind. Not compromising on quality, our award winning sea villas offer luxurious, spacious accommodation that feature a fusion of tradition and modernity in its interior designs. Within easy proximity of the Kuala Lumpur International Airport (KLIA), Golden Palm Tree Iconic Resort & Spa reveals the soul of its destination with the warmth of Malaysian welcome and the sophistication of service showcasing culinary arts in authentic local delicacies.